Did you miss Meet the Medium Size Dog Day? Can't get enough of the little Gus man (who is turning into such a character)? Click here. Don't know our big bad guard girls? You can meet Marta Beast here and see Crazy Daisy in action (and inaction) here. 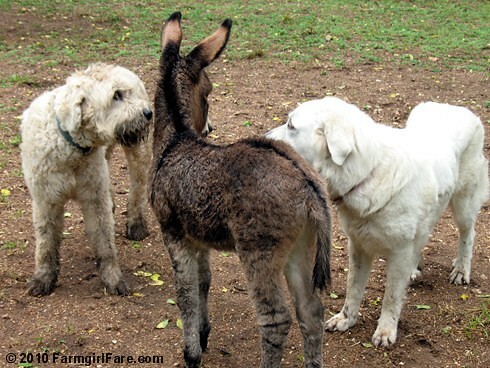 © FarmgirlFare.com, the inquisitive foodie farm blog where judging from the backlog, there seem to be lots more cute baby donkey photos than there are days of the week. Just like during lambing season (when new visitors sometimes wonder why this blog has been taken over by sheep), I try to intersperse the baby pictures with other subjects, figuring a donkey a day is probably a little too much. Love the ear activity on Gus! Those ears are so cute..he is so cute...thanks for sharing him and the girls today! I don't know about that. 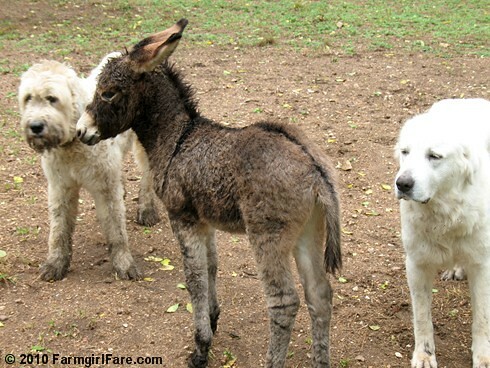 The daily donkeys are becoming one of my favorite updates -- especially baby donkey photos! I could easily look at a donkey a day for a long time. If anything I think you could use more posts about all the animals! Not that I'm greedy or needy. 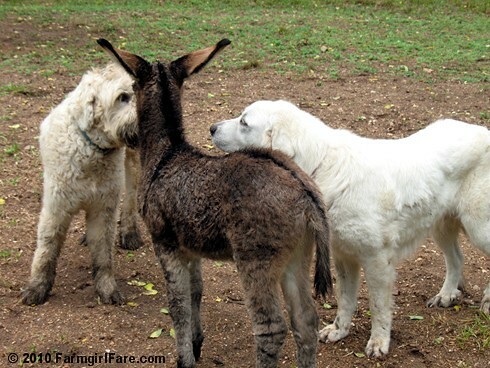 Loving the donkeys - and evidently the big dogs get along quite well with little donkeys! Oooo!! These pics are just too, too adorable. I could look at any of your animals any time, any day!! I was at a Hay Day celebration this past weekend and there was a donkey - so sweet!! I immediately thought of all of yours. Some sheep too - all so cute and so much fun to watch. Thanks again for sharing these with us - love them and you can never show too many! 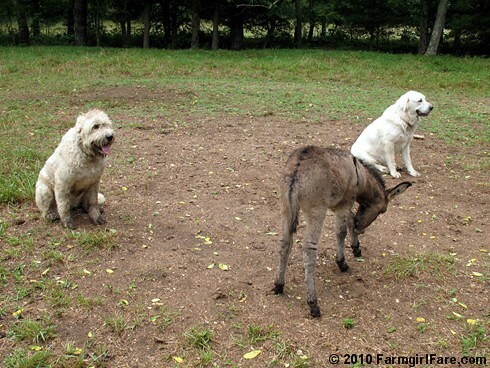 Oh I dunno--I think "A Donkey A Day" might just work! The dogs mirror each other's postures in the last several photos. Interesting, to say the least !~! A donkey a day sounds like just the right amount to me, you be the judge, so far you have pleased me every day for months. Thanks. Oh my goodness! I LOVE these pictures! OK, one of the cutest photo series EVER! 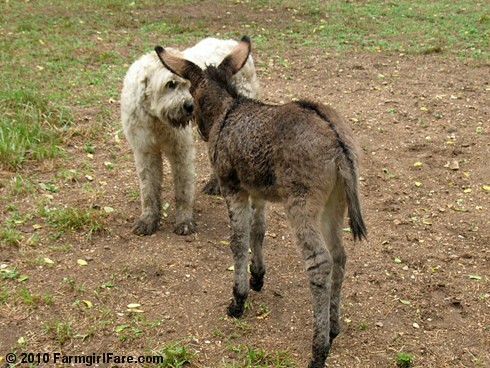 Cute dogs (love the dirty paws) and adorable baby donkey--what more can we ask for? Thanks! I camelooking for fig recipes (is that reasonable to expect if you live in Missouri?) and was delighted with this little baby donkey. I just met a bunch of her spitting-image French aunts and uncles the day before yesterday. Funny, inquisitive creatures--we were so tempted to get a pair of our own, since we have a land here in the south of France. Very endearing...thank you for making me laugh! What a couple of cutie-patooties! I wish we had the acreage for farm animals. Maybe one day!! Yay! Marta-Beast photos :) I love the look of that dog, she looks like a Muppet (in a good way). 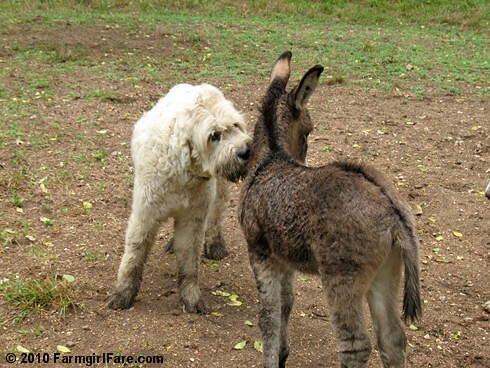 That donkey is the cutest-brightens my day! I love the two of them hanging out together like they have some place to be. This is our first visit here and we are so glad we found you. We have donkeys too, two miniature boys and they are characters. They are the best so we will never get tired of pictures of the donkeys. 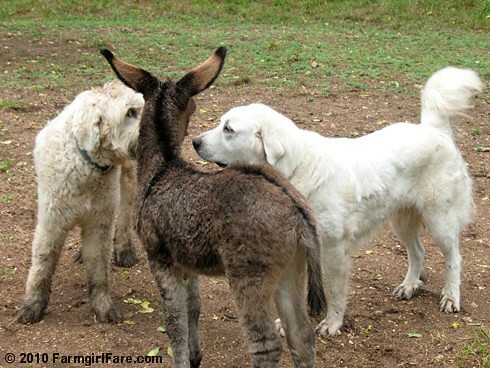 That is so cute the dogs inspecting that baby donkey. At least I think it is a baby. We have a goat too. We sure will be back to visit a lot. Have a great day. I love seeing the animals, especially the babies, but having lots of animals of my own I have to ask a few questions. 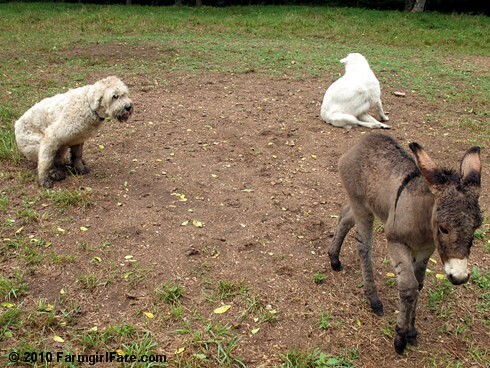 Are your guard dogs fenced in with the sheep, or can they get out of the pasture? 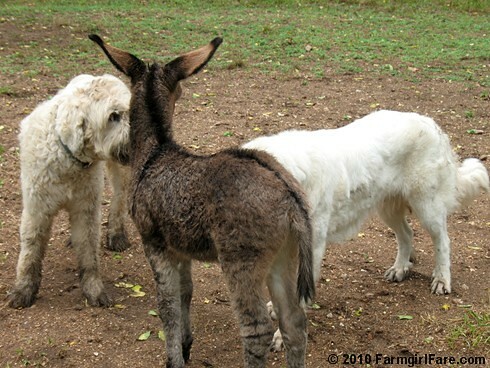 When I was traveling in Texas this summer, on two occasions I saw a big white dog on the outside (highway side) of a fence, trying to get back into a field of goats. Do yours wander, or are they pretty tight to where they're supposed to be? I suppose your relative isolation helps in that regard. Are they cool with all your animals (including the chickens)? Does Buddy sleep outside with the sheep and big dogs, or in the house? I'm always interested to see how other people manage their menageries. I have different problems, with a major highway wayyyy too close, and hordes of raccoons. It's been hard to find a yard dog that's bad on raccoons but easy on chickens. And also it doesn't do any good to have a dog on duty if my son drags it into the house every night to sleep on his bed. I only have 3 animals in the pasture right now, two older geldings and a senile goat. The horses seem to keep coyotes and the occasional mountain lion out of the pasture, but the goat believes he's the one protecting the territory and the horses. Marta looks like she luvs her some mud. Thanks for all the comments! So glad you're enjoying these photos. Okay, so right after I published this post, I started wondering if A Donkey a Day might actually be fun - and started working on a plan. First I went through my 'donkey' photo file and realized how many photos were in there that I loved but never posted, for one reason or another. I got such a kick out of seeing those downtown donkeys on your Sunday festival post. They sure know how to celebrate donkeys in France! P.S. I haven't seen any fig trees since moving to Missouri, so I'm not sure if they're here or not. I'm not a fresh fig fan (which was a shame since I had a darling fig tree literally dripping with fruit each year in front of my little 1930s northern California bungalow) so I never looked into it. She does look like a muppet, doesn't she? You should see her move - then you'd really think she was one. Poor Marta - you haven't seen her around the farm lately because I keep wanting to share her Day at the Dog Spa photos first - which I took back in MAY. I know, I'm terrible about posting things in a timely manner. Like, ahem, the new sheep barn we had built a year ago. Ack! Wow, lots of questions here. Okay, first of all, Lucky Buddy Bear (our Australian/English Shepherd stock dog) lives and sleeps outside. The only time he comes in inside is when he sneaks in behind us during a thunderstorm. The guy is terrified of thunder - and is quick. Bear usually sleeps under The Shack, where I'm pretty sure he's dug out a five story luxury condo complex for himself, our sweet beagle Robin when she was alive, the cats, and any wayward skunks who show up to play cards on Saturday nights. (You can always tell when the skunk loses!) He also has a cozy doghouse on the covered porch off the kitchen that he almost never uses. But Bear and the livestock guard girls, Daisy and Marta, stay awake most or all of the night, barking and guarding. The big girls catch naps during the day when the danger level is low. Bear, who lives to work, grabs 40 winks whenever he can. The guy can be out like a light. Daisy and Marta have complete run of the farm, and this is basically because they are able to get out of, through, under, over, around, and into anywhere - including the 10 strand barbed wire fence we put around the entire front field two years ago. The only time they were contained was when Marta (and her dear departed sister Lottie) were pups, and when we first got Daisy after losing Marta - and that was in electric net fencing. You can see a photo here. After we quit using that high dollar electric fencing (which is a whole other story), the girls did take off a few times. They were even spotted up on the highway, which is over a mile (if you follow the driveway) from our property. We spent hours searching for them to no avail, but they eventually showed back up on their own. We're in a unique situation here due to the fact that we're surrounded by thousands of acres of forest and our nearest neighbors are literally several miles away. So it's easy for the dogs to think that 'their farm' comprises a lot more than 240 acres. But pretty quickly they seemed to have somehow figured out where their territory ends, and as far as I know they now stay on the farm. But they go all over the place. Sometimes Marta will be way out in the sand field (which is about 1/4 mile from the house) with the splinter flock that is free ranging now, and Daisy will be up here by the barn. Sometimes they hang out together. During lambing season, Daisy pretty much took over barn guard and baby duty. A lot of times it seems like they've abandoned their sheep (like the sheep are way out in the fields and the dogs are asleep under a tree about 75 feet from The Shack), but whatever their system is, it's working because we've stopped losing sheep to coyotes. This comment is going to be too long for Blogger, so I'll continue it below. . .
On the downside, they basically kill anything that they think doesn't belong - skunks, raccoons, possums, moles, woodchucks, even birds. Some farmers like their properties free of varmints, but I don't mind them. Sadly, the dogs have also killed farm animals they shouldn't have, which I may write more about one of these days—though they would never harm one of their sheep. I have yet to find a perfect guard animal solution, and it's taken me 14 long—and often frustrating and heartbreaking— years to find this one. Our chickens are totally fenced in and can't be reached by the dogs, because Robin would attack them, and Bear would try to round them up so aggressively they'd probably drop dead of little chicken heart attacks. Since our guard dogs weren't raised with loose chickens around, I have no idea how they would react to them. I do know that Marta's mother lives in a large field (designated by a strand of electric fence wire - which she can get out of but almost never does) where she guards goats and a flock of pastured poultry. Every farm situation is different, and every dog is different, so it's hard to advise somebody as to what will work for them. Right now our system is working very well in most regards, but not in all. As for your farm, proximity to a major highway could definitely be a potential problem if you have a dog that is able to leave the property. I think a stock dog, especially one not raised with chickens, might tend to scare them - and might even kill them, either accidentally or on purpose. The Daily Donkey sounds like a great idea to me!! That white dog to the left is adorable! What kind is he? She's an awesome livestock guardian dog who is, according to the people we got her from as a pup, a tri mix: Great Pyrenees, Anatolian Shepherd, and Kommondor - all livestock guard breeds. She's as sweet as can be, but tough and scary (to potential predators) at the same time. And she always cracks us up! You'll find links to lots more photos of Marta - including adorable baby pictures - here. Thank you for the detailed answers. You know, Marta would look just fine if she wasn't in the same picture as Daisy, where she looks like she was washed "in the other brand" of detergent, and Daisy was washed in Tide. When her coat is trimmed short, you can really see the Komondor in her. You could investigate an English Shepherd for your needs. Go to englishsheperd.org and you will find breeders. Certain lines are better at pest eradication and killing other animals. Most of them are very good at chicken guarding except the ones who are used to hog herding as they tend to use their teeth more. What part of the country do you live in?